Step 1. 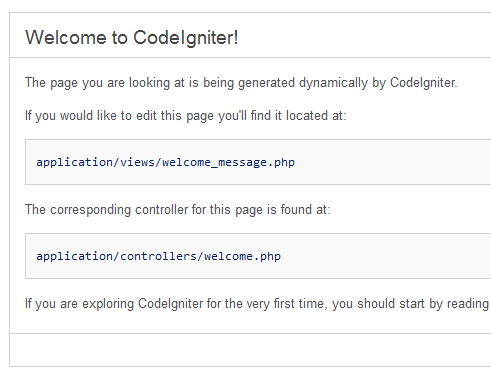 First of all download codeigniter and make sure that you project have the welcome screen. So if your first screen of your project looks like the image below, you just installed codeigniter framework to your project. Now that you inserted the table without any errors. Let's go to the next step. For more you can also see at grocery CRUD installation. Important Note: Please make sure that you don't have grocery CRUD to the index function of your controller as it is a known issue that it will not work on index. Just move it to another method. For example "employees" or something else except index. So let's save this file into: your_project/application/views/our_template.php and go to our controller and add some more stuff. Continue with tutorial and Basic Methods or go straight ahead to the methods/functions for the full documentation of each function/method with at least one example for each . grocery CRUD, doesn't work?. You can see the known issues or you can see the video common mistakes when we install Grocery CRUD (part 1) or find the answer at grocery CRUD forums. Still you can't install it? Ask your specific question to our really friendly community or send us a message at the support form and we will answer you as soon as possible.